Commercial grade table in Black, Mahogany, Walnut or oak finish. 1" thick melamine core top with Black "T" mold protective edging. 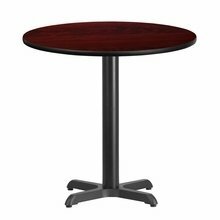 From 24x24 square to 48" round you are sure to find the table thats right for you. Tops and bases available separately as well.